Liriope is a sort of perennial plants belonging to the family of Liliaceae. A habitat of wild-growing representatives of this not numerous sort is East Asia where Liriopa can meet in the woods, mountains, on plains and near reservoirs. The plant received its name in a honor of the nymph to Liriopa, and in view of external similarity to a hyacinth to Liriopa often call a mouse hyacinth. In some dialects there are also such names as a peat lily and gadyuchy onions. Liriope differs in the low growth (20-65 cm), lack of a stalk, short and fleshy roots with the thickenings educations collected in sockets by the narrow and hanging leaves as at cereals, forming a magnificent bush, and the inflorescences similar to grapes clusters, with the small flowers (about 0,7 cm in the diameter) reminding flowers of a lily of the valley. Liriope. 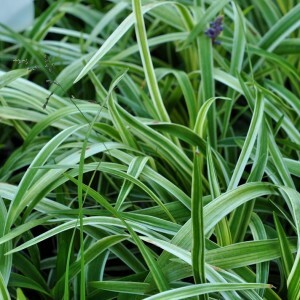 Liriope variety. Liriope cultivation.